As promised, here is my progress on the socks I’m knitting from the April Rockin Sock Club offering — a new Blue Moon yarn called Silkie Socks That Rock. This colorway is called Walking On The Wild Tide. (Click on the pics for a no-calorie biggy-size.) As you can see, the colors are not flashing or pooling, except in a very general way. I obviously hit just the right gauge for this particular skein. I am not knitting the April pattern. It was an open mesh pattern, and after swatching it I thought that the negative space competed with the colors. I really wanted something that played up the color without getting lost in it. A simple basket weave did just the trick. I’m afraid these seem fated to become the Seagrass Basket socks. But I’m open to other suggestions. I am knitting these in my standard sock pattern except with a star toe. I cast on while sitting in a plane, waiting to fly to Portland. I wasn’t happy with the toes and frogged them when I got home, then reknit. I did the increases on the toe every 3rd round instead of every other round, so the toe is longer and fits my foot better than star toes usually do. I am knitting on size US#1 Addi Lace needles. I’m loving the yarn, loving how it is knitting up, loving the pattern. I can’t wait for the weather to get cold again so I can wear them. Well… OK… I won’t go that far. The bumble bees and some of our other native bees were buzzing around while I took this picture of sock toes posing in my Spanish lavender. I didn’t see any honey bees, but the day was growing late. Too late to get a decent picture of the darker Moose Creek socks. It turns out that sitting on the tarmac in an airplane for hours and hours does lead to lots of time for knitting. 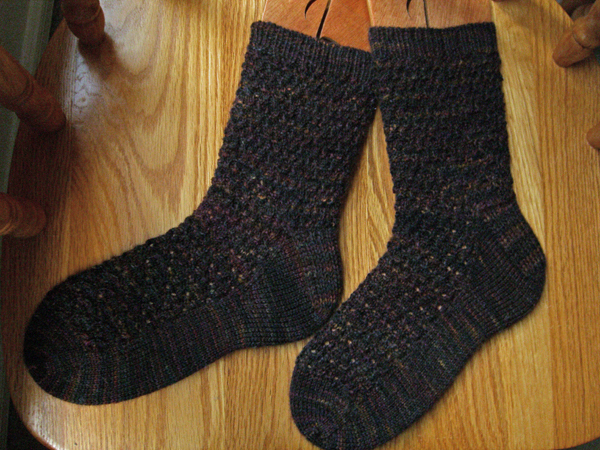 I finished the Moose Creek socks while waiting for thunderstorms to clear so my plane could leave Houston. I used Mountain Colors Bearfoot yarn in colorway Moose Creek. It’s lovely dark chocolates mixed with gold and very deep blues/purples. I tried to take this pic outside, but thunderstorms are moving in and I had lost the evening light. So I was forced to resort to the winter socks on a chair short. The colors are pretty true, though. Yarn: Mountain Colors Bearfoot (60% Superwash Wool, 25% Mohair, 15% Nylon/ 100g, 350yds per skein) in colorway Moose Creek — one skein, and I had a goodly bit left. Needles: Addi Lace Needles, US#1 (2.5mm). Pattern: Eyelet Lace stitch from Barbara Walker, used with my own standard sock pattern. 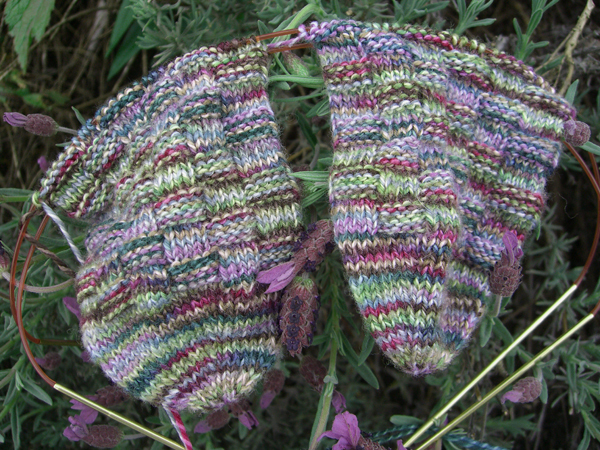 The heel flap is worked in heel stitch. I often add garter stitch edges, but this time I didn’t.